BUSH-LEAGUE: there’s no promotion for the game up in Canada, and not much more in the States. Why was this deal with Sportsnet only closed a week before the game (not to meniton it’s tape-delayed!)? And why does Arizona get home-field advantage when Rochester simply dominated the 2007 regular season with a 14-2 record?! 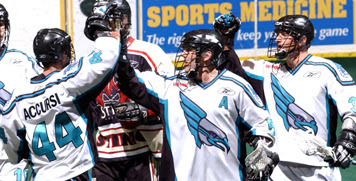 The NLL’s made some good strides in the last few years, but not having marketing or media support kills the sport and is the reason lax players are still years away from being able to play ‘professionally’.